Scotch Performance Green Masking Tape 233+, 26338 is a highly-conformable tape that provides the best adhesive transfer resistance, hugs curves, contours and provides outstanding paint lines. Goes on quickly and easily, sticks at a touch and stays put. Perfectly balanced to give outstanding masking results. Scotch Performance Green Masking Tape 233+ features the best developments in premium masking tape technology. Its unique green backing is highly conformable and has a clean edge designed for critical masking applications. The specially formulated adhesive sticks to most surfaces (including EPDM) and removes cleanly for up to five days. 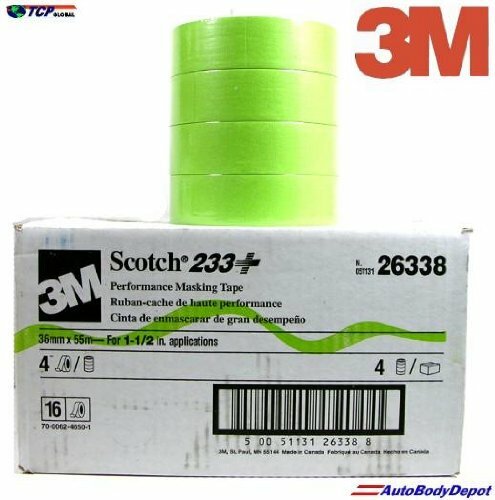 Scotch Performance Green Masking Tape 233+ also has excellent resistance to paint bleed-through and good temperature resistance of up to 250ºF (121ºC) (short term exposures). It is manufactured in an ISO 9002 registered plant to meet worldwide quality standards.